Food is one of the greatest choices we have as members of the 1st world. For the most part, we get to choose what we put in our bodies, and how much. The path people take to the way they eat as adults is a direct result of the experiences they have as children. Although I am no longer a practicing vegetarian (as evidenced by the extensive number of bacon related posts on my blog) I did spend about 4 years in my early 20’s with a very meatless existence. That choice was a direct result of the farm style living of my youth. Just before I started Junior High, my parents moved me from the Central Coast of California to a small farm in Eastern Washington state. It sounded like such a romantic and adventurous journey, my love of animals having the full indulgence it had always wanted. 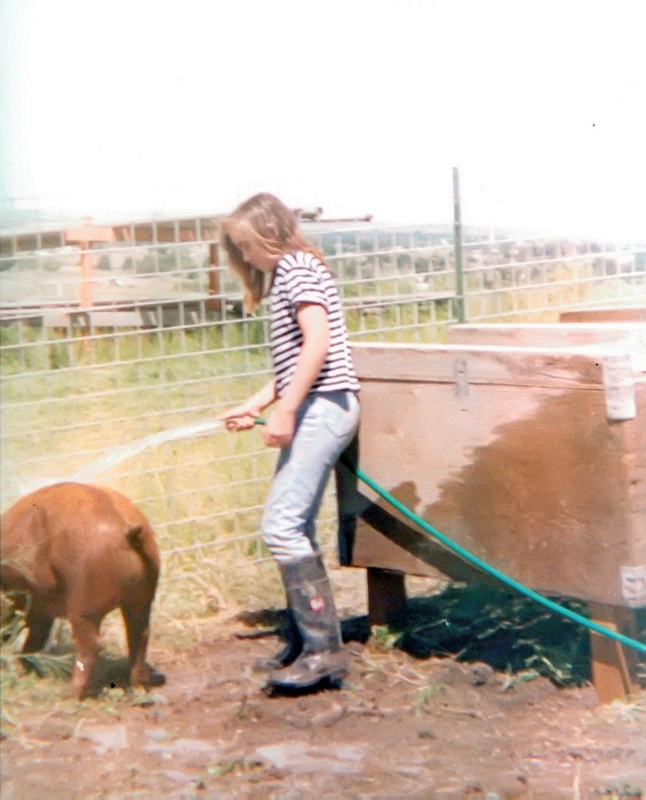 I was a 4-H kid, and the idea of acres and acres of animals was like a dream and within hours of a pig pen fully inhabited by squealing little pink and brown creatures I was in love. I named my favorite guy Garfunkel, as an nod to my love of 70’s music. I spent the summer feeding, walking, and training my new pet. In my head was the knowledge of the inevitable fate of this little guy, but some how it didn’t reach my heart. Then, towards the end of summer, came an old Chevy pickup truck. White and faded with wooden boards rising up above the sides of the truck bed. I watched from the window as the town butcher consulted with my step father, compared guns, pointed at the pigs, and unceremoniously shoots Garfunkel in the head. He struggles to get up. Another shot. He moves again. Another shot. Three days later, I stared at the pork chops on my dinner plate, unable to get the image of his last moments out of my head. Unnerved by the feeling of knowing the first name of my dinner. Although this is a brutal reality for the meat eating world, and one that we should come to terms with if we choose to eat meat, I am not advocating for everyone to go vegan. I know that the pigs my family raised had great lives. They were loved, cared about, and fed well. If it wasn’t for the dinner they became, they wouldn’t have existed in the first place. Choice. Choosing to spend more for free range. Choosing to support local growers. Seeking out raw milk and cheese from reliable farms. Because if the story of Garfunkel is horrifying to you, it is Disneyland compared to way some commercial farms are like. Let me know what you think. If you disagree, agree, or even if you don’t care. 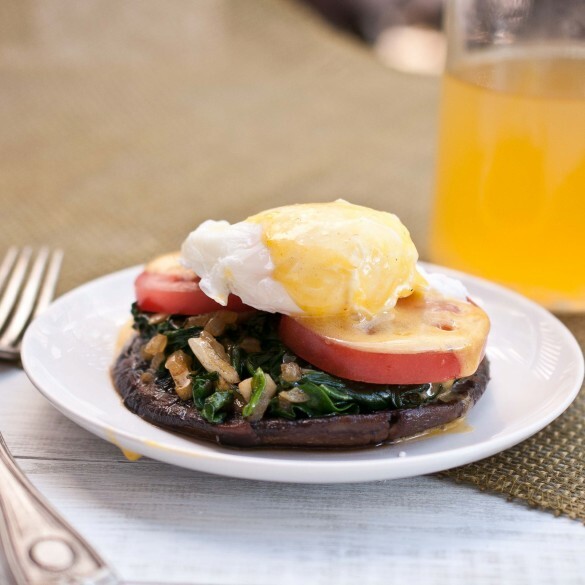 In the interim, here is a meatless breakfast that will give you a break from meat, if that is what you are looking for. In a pan over medium high heat, add the oil and allow it to get hot but not smoking. Place the mushrooms in the pan. If the pan is two small for all of the mushrooms to fit, cook in two batches. Turn the mushrooms once the bottom has turned dark and has softened, about 4 minutes. Sprinkle with salt and allow to cook on the other side until the entire mushroom is dark, soft and cook all the way through. Remove cooked mushrooms from pan and add the spinach, onions and garlic, cook until soft. Melt the butter in the microwave. In a good quality sauce pan, add the yolks, lemon juice and water and whisk quickly and continually over low heat until it’s frothy and doubled in size (this is an arm work out, be prepared). You don’t want too much heat or you’ll have scrambled eggs. If you need to step away for even a second, or if it’s getting to hot, remove from the heat. While continuing to whisk, slowly add the butter in a steady stream. Continue to whisk until thickened, and almost doubled. If your sauce gets too dry and thick, you can add a few tbs of water. Add the sriracha, and salt and pepper to taste. 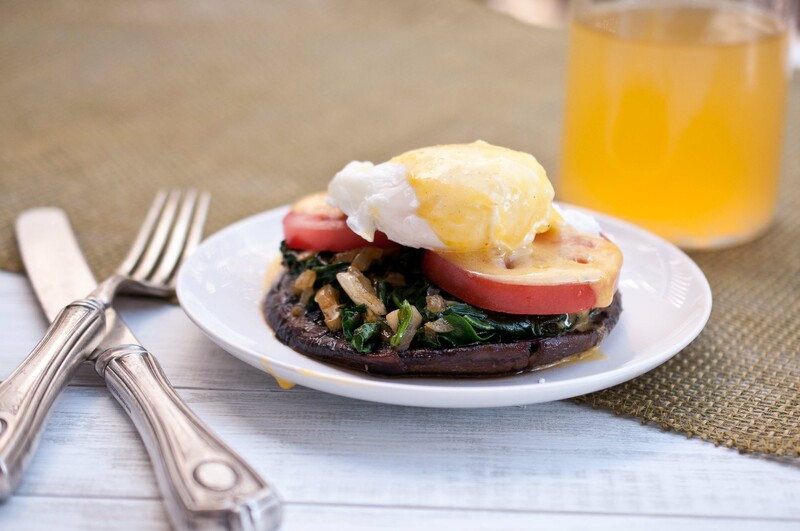 Place the mushroom on a plate, top with spinach, then tomato slice, then poached egg and drizzle with hollandaise. I just discovered Sriracha about a year ago and I’m hooked! I do favor things from the local farmers around here and I would love it if I could come by all my food that way, but sadly that will never happen. Portobellos are my first pick when it comes to a meatless meal and you have really prepared this nicely with that siracha sauce. This one does look like it should grace my table and soon. Great dish! When I was meatless I ate them daily! I try to buy local as much as I can, but you’re right, it isn’t always possible. Sriracha hollandaise? I’m all over this! Sounds amazing! And, yeah, finding and choosing quality food is so important (and so tasty!). Poor Garfunkel… This dish looks ridiculously good! 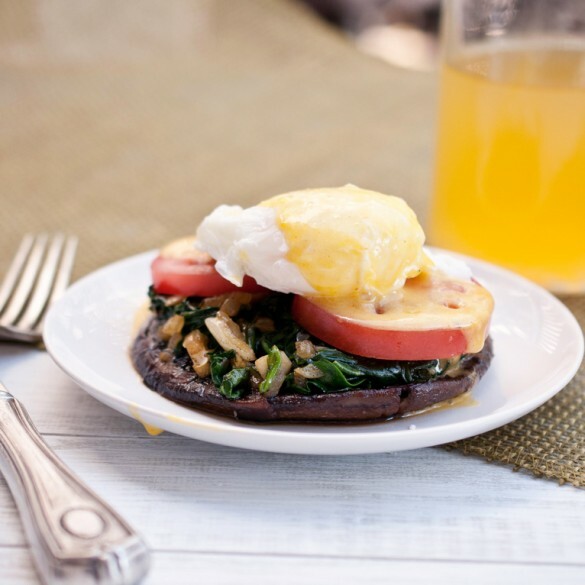 I rarely eat meat, love mushrooms, and I’m all about this sriracha hollandaise! This looks great! I love substituting mushrooms for meat every now and again. If it were up to my husband we’d have a steak for every meal every day. I like the option of a portabella bc it really gives the feel of meat. It does have a meat feel! It was my “burger” patty when I was veg and went to BBQ’s. Sriracha hollandaise sounds amazing. I will have to make that asap. I love seeking out locally grown food too. I like knowing where it comes from! What a horrible story about Garfunkel! I am loving this idea of using a portobello and of course, the sriracha hollandaise! You had me at sriracha… I bet that tasted amazing. I live in Seattle and totally support local farmers and buy organic and free range. I have all of my milk, yogurt and butter delivered to my door by a local farm every monday. It’s pretty awesome. You got to support local and feel good about where your food comes from. That’s so awesome that you get a dairy delivery! You’re my hero. I get a produce delivery sourced from local organic farms, but I haven’t found a dairy one yet. Something to look into! Quite fantastic. My partner and i are vegetarian and this looks great. That piece of mushroom looks so juicy and delicious! Chinmayie, I agree that how we are raised makes a big impact on how we see food. Even with regards to fast food and health habits. I wonder how different I would eat now if I had also grown up as a vegetarian rather than on a pig farm! This sounds so great too! Can’t get past your story about Garfunkel. What ever made you give up vegetarian diet? Eating meat is sooo unhealthy, and so cruel to the animals. I completely understand where you are coming from MaryJane. I think it all started when i really wanted to learn to cook and learn classic techniques and those included meat. Then it evolved past that, and my desire to patronize farms that are good and kind and give animals great lives. As a farm kid I saw that these animals only existed for the purpose of food and if everyone in the world became a vegetarian there would be no need for meat cows (they are different from dairy cattle) or the pigs that I love so much. I would rather the animals have good, happy lives than no lives at all. I will always support 4-H and FFA because I know that there is no better lives for animals then with those kids. It is a persona l choice and I often go many days without eating meat. I can also see going back to it for periods of time through out my life. It’s clear that you have a good heart and care deeply for animals! I think eating meat responsibly (i.e. from humanely raised and kept animals) gives you a greater “power” over the meat industry than eating no meat at all. Vegetarians’ and vegans’ opinions don’t matter one bit to the meat-industry, because they don’t fork in the money, you know. But people who eat and buy meat every week have to be taken seriously by meat producers, since they’re their target group. If more meat-eaters chose to buy locally and from farms who treat their animals well in life AND death, now that could really make a difference! I completely agree, it’s like voting with your dollars. Once you find a farm that treats it’s animals well, it is important to support those people. I love meatless dishes! I try to be a vegetarian when Jason isn’t in town, which isn’t as bad as I thought it would be. I will definitely be adding this to my meatless recipes. And I’m so excited about this Sriracha hollandaise. I put Sriracha on EVERYTHING so I’m sure I will love this.